I thought before I finally get around to hanging this quilt on my bedroom wall, it would be fun to show off the quilt that started (and almost finished) my quilting hobby. I grew up loving Little House on the Prairie, so somewhere always within me there was probably this fascination with all things handmade. If I remember correctly, at a homeschool event, I made a simple little nine patch quilt block. And, I think that was all it took. From there, I took a class at my local quilt shop. In high school, my family lived literally 15 minutes away from nearly anything that resembled civilization except for a pizza place, a little general store (that achieved nearly heroic status when it started selling soft serve ice cream), and a quilt shop. Sigh…those were the days. If I lived 5 minutes from a quilt shop now, I’d be in my glory…and broke. But, still. Oh well, at least Joann Fabric is on the way home from church. I stop in there and raid their remnants bin on a regular basis. Still, an honest to goodness, quilt shop on the way home would be amazing. I digress. So, I think it was in high school that I took my quilting class. And, I was determined to do everything by hand. I’m not even sure if I had my first sewing machine at that point. 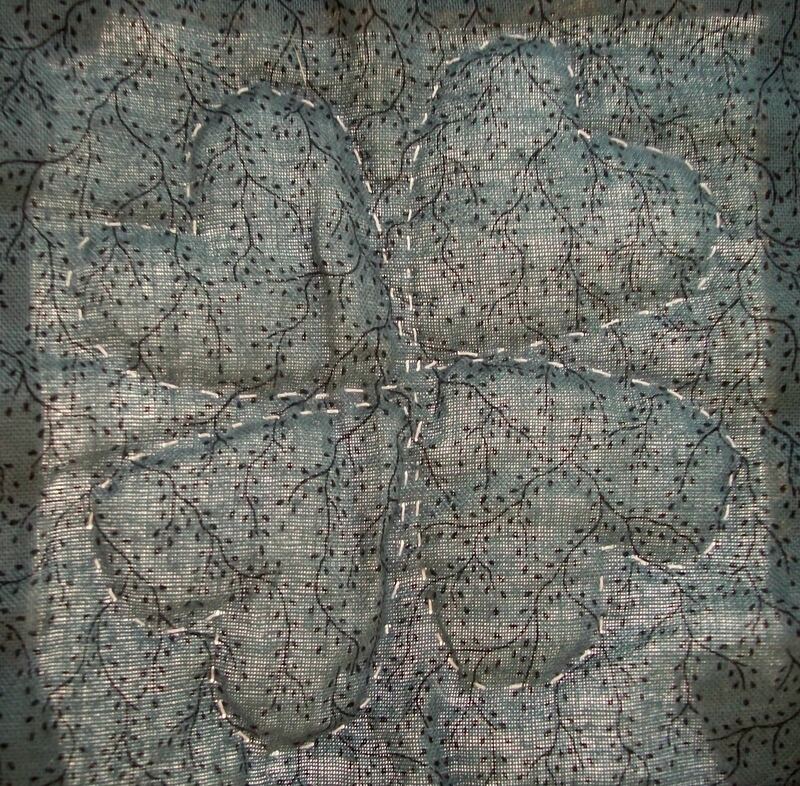 I might have, but I wanted to my quilt to be unpolluted by the stains of modern technology. I also wanted it to be museum quality. So, I obsessed over putting in the teeny tiniest stitches I could possibly make. And, that took forever. I did the project in fits and starts. Seriously, I just finished the binding last year, and I’m 32. Fortunately, even though I’m using a different quilt in my bedroom, it’s still the same colors as the quilt that I had in high school, so I can still use this — even though I’ve switched bedrooms 5 times since I started making a quilt for my bedroom. This picture isn’t the absolute best. Sun was shining straight through the quilt, so we can see that I still hadn’t learned that sometimes it’s a good idea to press the seams of dark fabrics toward the dark fabric. Fortunately, the sun does not shine through my bedroom walls, so no one will really be the wiser. I also hadn’t learned to handle the bias edges of triangles with care. 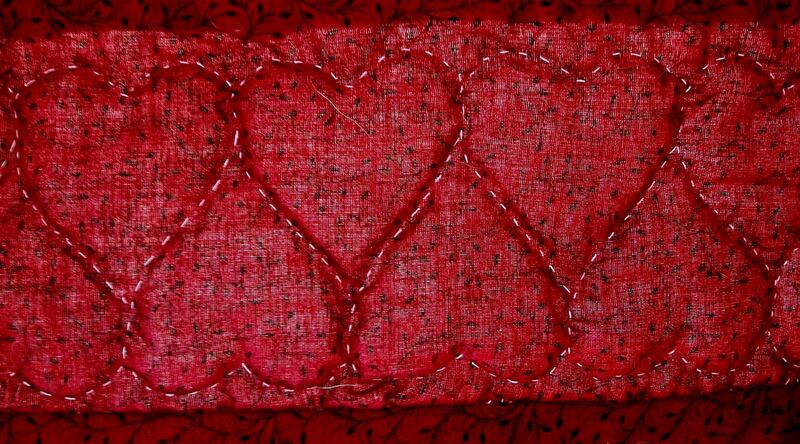 I quilted many, many hearts into the border of the quilt. I know now that museum quality stitches aren’t just tiny, they’re supposed to be even front and back, which isn’t the case on this quilt. Still, I like that I tried to have some design flair. And, I really need to get on with learning free motion quilting. As much as I like straight line quilting, it would be handy to know how to quilt shapes again. I did branch out for the borders around the blocks…probably because I couldn’t make hearts tiny enough. And, there you have it. Taking over 10 years to finish a quilt was a bit much for me. I won’t say that I’ll never hand quilt anything ever again because it is nice to work on something in front of the TV or to be able to pick up something and move with it. But, I’m a machine quilting girl now. With so many beautiful fabrics in the world to combine, I want to get through projects in a reasonable time. 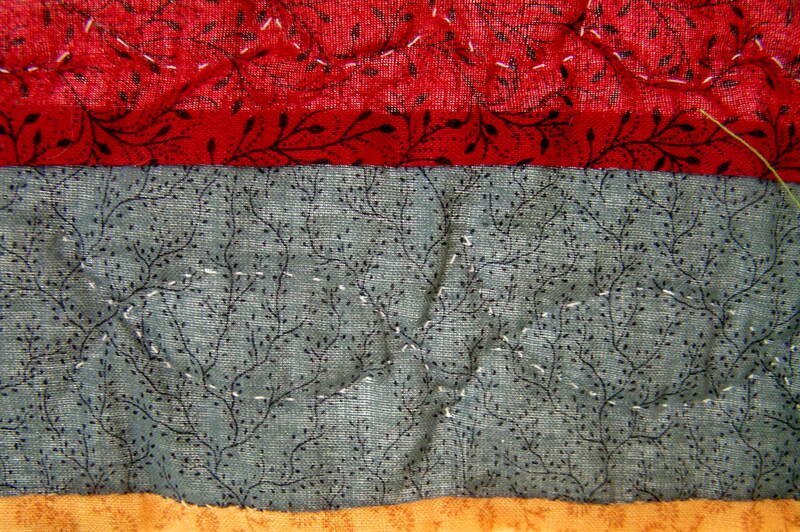 And, there is something that I love once I get to the stage where I start quilting. For me, there’s almost a magical transformation as three separate layers start to meld together and drape nicely, and I’m no longer fearful — fearful of losing pieces, fearful of stretching something out of shape. Instead, I’m seeing a beautiful, useful creation emerge within my hands. I love hand quilting too! What a beautiful first! Thanks! I haven’t been doing much hand quilting lately, but it is great when you can transport your projects all around 🙂 My sewing machine doesn’t quite pack up into a bag so well. 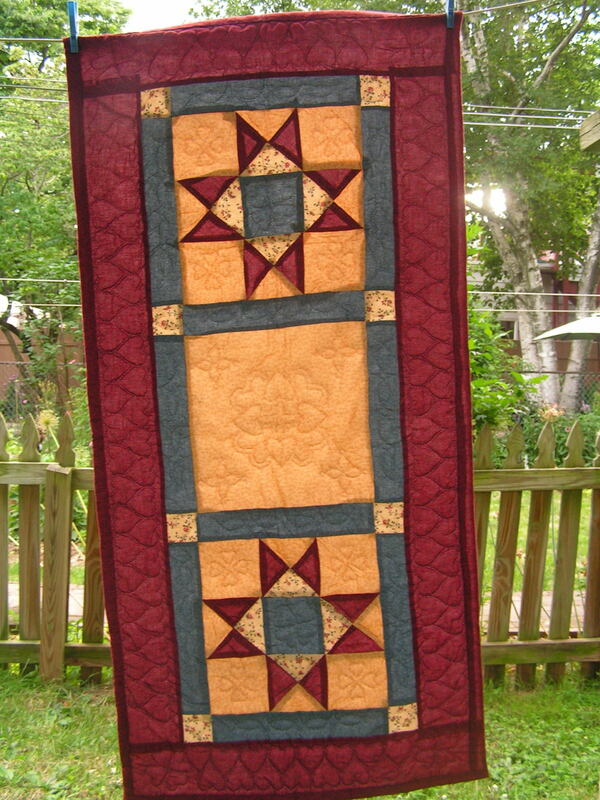 What a great first quilt story! I love those darling hearts! Thanks for linking up and playing along!